It is both amazing and frightening how easy it is to get dangerously comfortable and think ourselves right in the eyes of God when – in actuality – we are not. We can be harboring ungodliness and not even realize it! Like the old song says we need God to shine the light of heaven on our souls. We must prayerfully examine our ways, thoughts and actions. With that in mind, let’s unpack 5 ways we can be harboring ungodliness. Then we’ll look at some things to do when we find it hiding out in our lives. I know you might be thinking of the homosexuality so prevalent and praised in our society today, but that’s not what we are discussing here. Paul uses the Greek word ἄστοργος (astorgos [as’-tor-gos]) which is translated “without natural affection.” It means hard-hearted towards kindred, unsociable, inhuman [very cruel, unfeeling], and unloving (Strong’s Hebrew and Greek Dictionary; Thayer’s Greek Definitions). So, how can believers harbor this ungodliness? Let me give you some examples. I have witnessed foolishness like this amongst professing believers, and it is dangerous. It’s dangerous because it seems too many of us like to believe that how we behave at home, how we treat our families, does not matter as long as we are “good”/look good to others. The truth is, however, that it matters to God how we treat our families. To neglect and ignore the needs of our spouse, children, and/or parents is ungodly. Sometimes I wonder if we realize the messages we send by our actions towards others. I have heard adults display disturbing attitudes regarding their parents. Oftentimes these individuals, while raised poor, were not abused or neglected. Yet there’s a hardness towards their parents that I find difficult to understand. Some are so harsh when they do mention their parents that one wonders if they have any love for them at all, and I am talking about professing believers. I can’t tell you how many times I’ve seen & heard about wives & mothers and/or husbands & fathers who won’t keep themselves or their homes clean and lack the qualities parents should have for their kids. There are husbands who refuse to treat their wives with basic courtesy, and vice versa. I have personally witnessed a mother (a khristian) maliciously embarrass their child by verbally abusing them [ALL the time] in public. God is not pleased with parents mistreating and neglecting the needs of their children. He is not pleased with the mistreatment of spouses. He is also not pleased with children disrespecting/neglecting their parents. We can think ourselves great, but if the natural affection (the love) that automatically comes with the territory for our families is missing, then in us ungodliness has found shelter. A lack of self-control can reveal itself in a number of ways. Self-control is one of those things in which we can always do better in one area or another. One may have self-control when it comes to talking too much but may lack self-control when it comes to indulging in their favorite foods. Another may have the self-control to avoid gossip but may lack restraint when it comes to handling their anger. Self-control can be quite the beast to conquer for many of us. Self-control, or temperance as the KJV calls it, is to have power over oneself. This hedonistic society thrives on pleasure/self-indulgence at any cost, but believers are to exercise power or control over all our desires and appetites (Gal 5:23; 1 Cor 9:25; Phil 4:5). We are instructed to be people of self-control. God is not going to force us to practice self-control in all things (1 Cor 9:25). God will help us, He will strengthen us. It is, however, up to us to desire to please Him more than ourselves. We cannot just give in to the requests of our flesh, make no effort to obey the Word, and try to cover it with an “I just can’t,” he/she shouldn’t have said/done that, or that old “the devil made me do it” excuse. None of that will fly with God. Talk, our society is filled with it. Sometimes we, believers, indulge in it way too much. As a whole, we could stand to talk a lot less. The Bible clearly instructs us on talking, and we should really use talk more purposefully than we do. This is an area we all need to examine closely. How many times have you noticed believers using their tongues to slander others rather than to encourage or pray for them? I have watched those who claim salvation use their words to literally drive people away from the church! How many times have we ourselves used our tongues as a tool of disparagement, more concerned with what we want to say than we are to please God with our words? How are we using our words? Are we thinking BEFORE we speak? Are we rude and uncaring in the things that we say? Do we care whether or not what we say could potentially hurt the hearer? Do we use our words to encourage, uplift, or glorify God, or is our talk foolish, hurtful, and/or destructive? Do we have self-control when it comes talking? Something to think about isn’t it? If we don’t mind our mouths then we are a habitat for ungodliness. Ungratefulness is one of those things that can be hidden from our view. It is revealed, often to others, via our words and attitudes about what we have/don’t have, want/don’t want. It can become such a part of us that mindless complaining is just what we do. Being ungrateful is dangerous and God definitely does not like it; just read about the children of Israel and how the Lord grew tired of their complaining, of their ungratefulness (Exodus 16:2-8; Numbers11:1-35; Numbers14:1-36; Numbers 21:4-6). Human beings are born complainers; we don’t have to cultivate it, it comes as natural to us as breathing. As believers, however, we have to embrace gratitude and put away ungratefulness and complaining. We have to be diligent in this area because we can so easily take God’s goodness for granted. We must be careful not to kowtow to our flesh when we get the urge to give in to ungratefulness. If we are constantly complaining, we are disobedient (1 Thess 5:18; Phil 4:6; Eph 5:20), thus giving shelter to ungodliness in our lives. Pride; the bane of man’s existence. Pride is something we always have to be on the lookout for and guard against. Pride can rear its head in many, often very subtle ways. Pride is something God hates, and every believer should hate it as well, especially when discovered in themselves (Prov 8:13; Prov 6:16-19). Think about the above 4 issues we have looked at. Is not pride at the helm? Pride reveals itself in innumerable ways; here’s 50 to start with right here (list taken from “The Fifty Fruits of Pride” by Brent Detwiler). Pride is nothing to provide a safe haven for. It is destructive; it will set us at odds with God, and will ultimately lead to our ruin (Prov 16:18). If it’s in our hearts, and we refuse to uproot and get rid of it, then we are most definitely harboring ungodliness. We have looked at 5 ways of harboring ungodliness (this is not an exhaustive list by any means). So what do we do if we have discovered ungodliness in our lives? I’m participating in the following linkups! 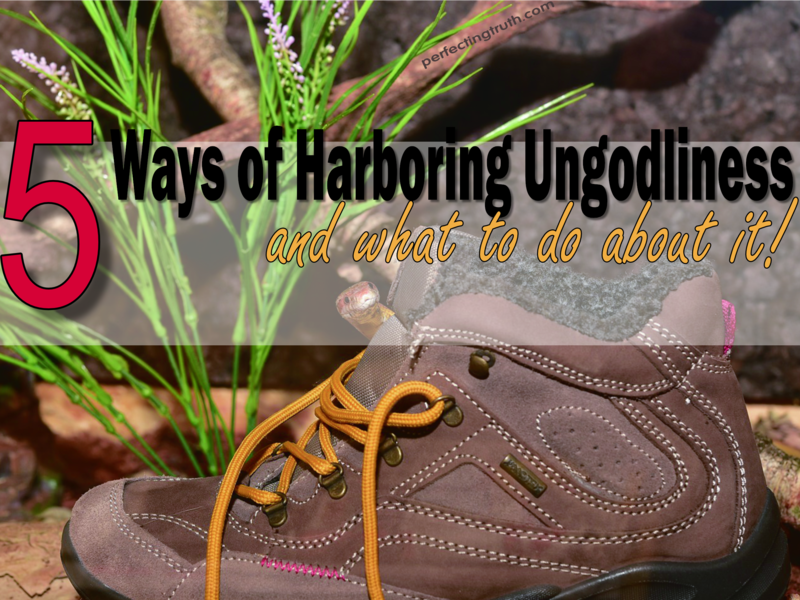 *What are other ways we can be harboring ungodliness? *Have you had to uproot and get rid of ungodliness in your own life? *What advice would you give for anyone struggling to let go of ungodliness? Ooh, that talking too much one! What a great point. I wonder how things would go if we all talked a lot less but were very careful with our words. God bless! Hello Heather. Talking is just one of those things. I believe a good portion of life would improve just by being slower and more purposeful with our words. This is a really good post!! Today, we see and hear that people just want to be able to SAY they are believers. A lot of people want to SAY they live for God. The real statements are the ones we make with our actions. What we actually do with our lives, is what says whether we are believers or not. What we actually do with our lives, is what says whether we are living for God or not… When a person starts believing & living for God they won’t be able to harbor any ungodliness, because true believing and true living by faith, changes every aspect of our lives and cancels out all ungodliness. —— What is considered to be godliness these days, is not! True godliness puts an end to all ungodliness!! Well Said Rodney! We have to watch ourselves, actually think about the things we do and say in light of God’s Word. We have to be diligent about the lives we are living. Standing guard against ungodliness, because it can creep in quietly when we don’t stand watch. Thanks for taking time to read and comment on the post. God bless you! I love how you break it down. I don’t think I’ve ever really considered having a messy house as a form of ungodliness before, but I like how you bring that to light. The house being a mess isn’t the issue exactly but a symptom of the root. Thanks for sharing today! Thanks so much for taking time to read the post and share your thoughts. I am elated that you found it beneficial :). Wow, so much to consider in your post today! Two things came to mind as I read this and I will talk of Pride first. What I have seen at times is hidden pride that people generally don’t hear about; or what one might call False Humility. Perhaps others have noticed it when praising someone for a gift or traint you lack yourself and person protests far too much against your compliment but their demeanor is one of delight at the need to be humble which is a stark contrast from a simple Thank you, and acknowledgement the the gift was God given. I don’t say this as an excuse for anything; just to let others know that there may be times that a loved one, a church member, or even a stranger may not be in control. I love that you keep blessing, and challenging us to keep an account of what we really can do better. In reading your response regarding pride I thought about Barney Fife. I could just see his look of fake humility when someone paid him a compliment; Barney could be the poster child for pride! I do know that you are right in your example though; I have seen this as well. Pride is a beast! We really have to stay on it since it always tries to creep in anyway it can. It’s like the annoying Morning Glories in our yard. We thought we had gotten rid of them 10 years ago, but to this day they still show up, and in places they were never planted; we are always uprooting them. So it is with pride. It is never good to be quick to judge. I have experienced that as well, and from people who had never met me; they just saw me once or twice and jumped to the conclusion that I was something totally against character i.e mean! I am shy (brought on by mistreatment, but I’m better & getting even better thank God) and often unsure of how to respond; sometimes I just can’t seem to respond quickly enough; I can write all day but verbal words just don’t come that fast face to face…especially with those I don’t know/know well. I have been accused of being prideful, of even trying to take God’s glory – can you believe it! We have to be so careful not to make blind assumptions about people before we know them/their story. I am so sorry you’ve had to endure such painful situations, but I am thankful to God you are still standing and doing well. There are situations that arise like the painful ones you’ve described. There are times when one may not be in control, and that is when family/church family needs to use patience, compassion, mercy, and understanding. It would behoove us all to learn to give others the benefit of the doubt more. These days people don’t like to do so, but we will all need it at some point. Thanks for reading the post, and being so candid in sharing a little of yourself with us. I am thankful/happy you found the post beneficial.